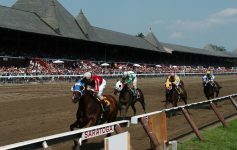 Home > Uncategorized > Going to the Races in Saratoga: What’s YOUR Experience? Going to the Races in Saratoga: What’s YOUR Experience? Well…there are myriad experiences available for the taking when one makes the pilgrimage to the renowned Saratoga Race Course. Some prefer the Clubhouse. Others like to picnic with friends, camped right outside the paddock. One fellow on YouTube documented his entree to the track for the first time–and hauled himself out of bed to be outside the Union Avenue gate for 4:30AM. God bless him! I wish I could relate to this experience, but I can’t. I’ve never gotten up that early for anything other than to watch a horse workout at the track! But many people DO get up at a beastly hour, to run through those gates when they open at 7AM, to get their preferred picnic spot. As said the gentleman, himself, it looks like the running of the bulls. Please watch the embedded video, and send in your comments. We’d like to hear about your preferred way to go to the races. If you’re a 4:30AM, outside-the-gate runner–because those folks DO run like mad to get to their favorite spot–or perhaps you’re a Clubhouser. Or you arrive just before the first post at 1PM, and take your chances. Whatever your favorite way to go to the races, please tell us. As many people exist who are fans of racing–that’s how many different ways there are of experiencing the racetrack that is unlike any other on Earth. Everyone has their own wonderful memories of Saratoga Race Course, and a Day at the Races. Tell us yours! Oh, and…the poor fellow who did the vid must, indeed, be a newbie: he didn’t realize that the Saratoga Raceway is NOT the Saratoga Race Course, whence run the Thoroughbreds. Saratoga Raceway is the name of the harness track on Jefferson Street. We love the harness track, but all racetrackers know the difference in the names, breeds and styles of racing of the two racing ovals. So cut the guy a break–we’ll tell him if ever we meet him. But enjoy his video, and then please send in your comments to us at Saratoga.com. We want to know how YOU best enjoy your Days at the Spa! Thanks, and–may the Horse be with you, as always! P.S. Word to the Wise: If you ARE among the group of people who get there for 4:30AM, to run in at 7AM and get your favorite spot…you might want to consider going to the NELSON AVENUE gate, instead of Union. Clubhouse entrance and general admission there…and they open the gates for breakfast. Far fewer people with whom to compete as you cruise onto the grounds, to find your ideal spot. Next Article Horse Sense: The Odds Mean NOTHIN’.